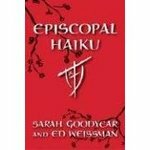 A friend sent me an encouraging card and a copy of Episcopal Haiku today (thanks, H!). folks fear they'll mispronounce names. But who knows what's right? We look forward to spring time.